Start off your visit on the 17th (Sat): stroll through Mindil Beach. On the 18th (Sun), you'll have a packed day of sightseeing: get interesting insight from Tours. For more things to do, ratings, and more tourist information, refer to the Darwin driving holiday planner . Melbourne to Darwin is an approximately 6-hour flight. You can also drive; or take a bus. Expect warmer temperatures when traveling from Melbourne in August; daily highs in Darwin reach 37°C and lows reach 22°C. Wrap up your sightseeing on the 19th (Mon) to allow time to drive to Jabiru (Kakadu National Park). Jabiru is a town in the Northern Territory of Australia. Jabiru (Kakadu National Park) is known for nature, wildlife, outdoors, and trails. Your plan includes some of its best attractions: don't miss a visit to Ubirr, see the interesting displays at Warradjan Cultural Centre, contemplate the long history of Nourlangie Rock, and look for all kinds of wild species at Yellow Water. To see ratings, maps, reviews, and more tourist information, go to the Jabiru (Kakadu National Park) day trip planning website . Drive from Darwin to Jabiru (Kakadu National Park) in 2.5 hours. Alternatively, you can take a bus. Finish your sightseeing early on the 22nd (Thu) to allow enough time to travel to Uluru-Kata Tjuta National Park. Uluru-Kata Tjuta National Park is known for nature, museums, outdoors, trails, and classes. Your plan includes some of its best attractions: explore and take pictures at Uluru, take an in-depth tour of Uluru-Kata Tjuta Cultural Centre, head outdoors with Walpa Gorge, and don't miss a visit to Field of Light. 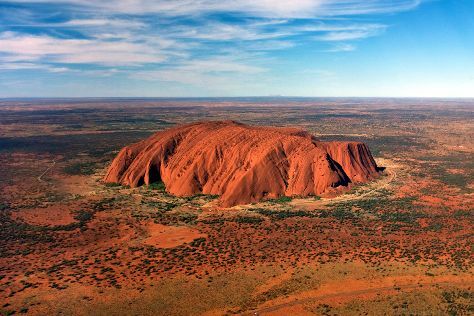 To see photos, where to stay, traveler tips, and more tourist information, read Uluru-Kata Tjuta National Park trip itinerary maker site . You can do a combination of bus and flight from Jabiru (Kakadu National Park) to Uluru-Kata Tjuta National Park in 14.5 hours. Alternatively, you can drive; or do a combination of car and flight. In August, daytime highs in Uluru-Kata Tjuta National Park are 27°C, while nighttime lows are 6°C. Wrap up your sightseeing on the 25th (Sun) early enough to travel to Melbourne. Step out of Melbourne to go to Torquay and see The Great Ocean Road, which is approximately 1h 40 min away. Dedicate the 30th (Fri) to wine at some of the top wineries in the area. The adventure continues: take in nature's colorful creations at Royal Botanic Gardens, enjoy breathtaking views from Eureka Skydeck 88, explore the world behind art at National Gallery of Victoria, and make a trip to Block Arcade. To see traveler tips, more things to do, photos, and other tourist information, refer to the Melbourne online holiday planner . Traveling by flight from Uluru-Kata Tjuta National Park to Melbourne takes 5 hours. Alternatively, you can drive. Traveling from Uluru-Kata Tjuta National Park in August, expect nights in Melbourne to be about the same, around 6°C, while days are slightly colder, around 16°C. Wrap up your sightseeing on the 31st (Sat) early enough to travel back home.